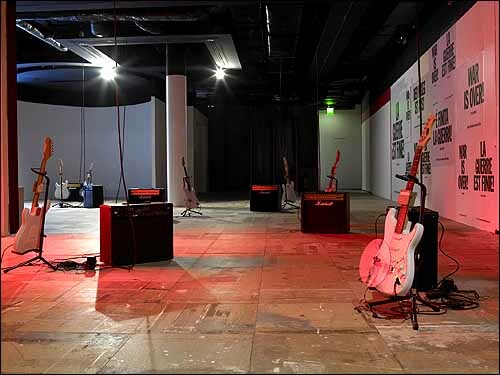 At the Documenta 12, Afif presented Black Chords Play Lyrics (2007), a work that translated the Lyrics project through his Power Chords (2005), first shown at the 2005 Lyon Biennale. 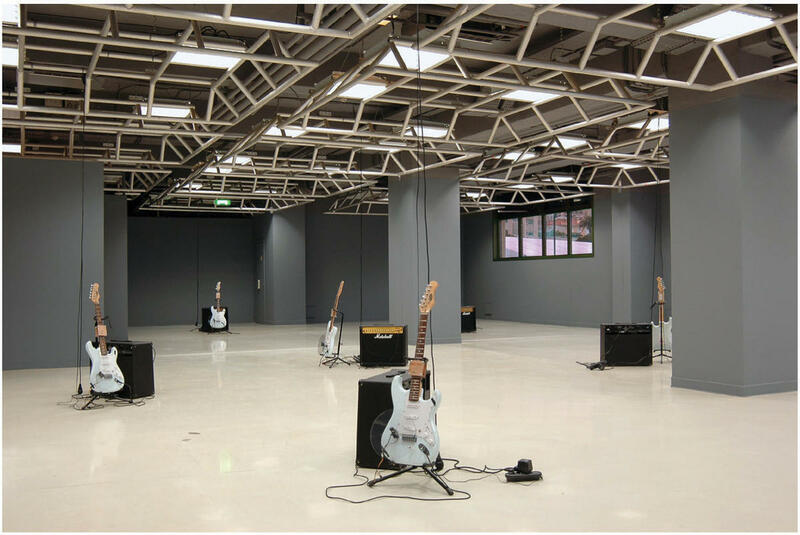 Power Chords consisted of eleven white electric guitars propped up on stands that, with the aid of a computer program and rotating Perspex discs placed across their strings, seemed to be strumming themselves. The music they performed was arrived at by the artist through matching each of the colors in Cadere’s Barres de Bois to a “money chord” used by rock musicians, which is to say the popular chord progressions that cause fans to really lose it in the mosh pit and drivers in drab, Northern European towns to gun their cars like they’re speeding down Ocean Drive. 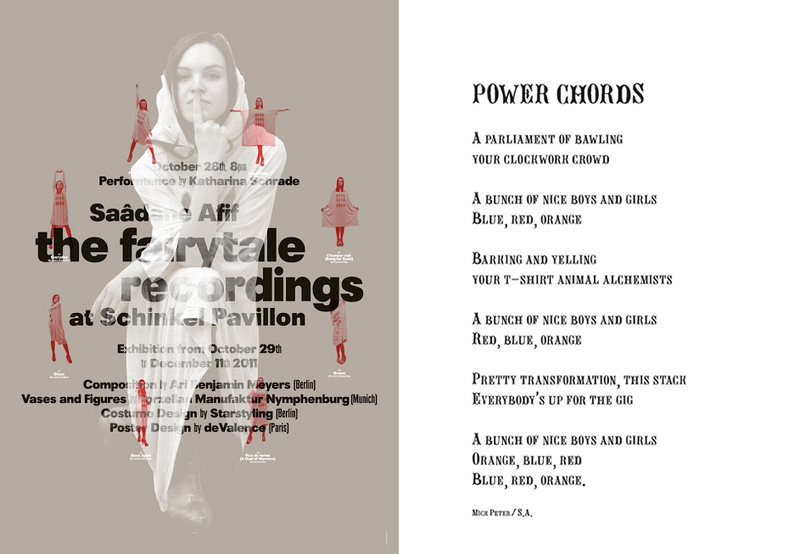 Black Chords Play Lyrics exchanged the white guitars of Power Chords for black ones, and Afif’s scoring of Cadere’s work with a musical transcription of the words written for the Lyrics project, which itself alluded to the Barres de Bois in the piece Ghost. What the artist set in motion at Documenta was a dense compacting of his recent oeuvre (it’s no accident that the color of the guitars recalled the result of an imploded white dwarf star, a black hole), in which cause and effect were shuffled, and it was impossible to tell which element was riffing on which or, for that matter, the sequence in which one collaborator passed the baton on to another-nobody, here, plucked at the guitars’ strings. Creative genealogies were erased, and the “retrospective exhibition” of the Lyrics project became a thing that belonged to right here, right now. Among the most inventive artists on the young French art scene, Saadane Afif works with notions of displacement and contrast. His pieces, vibrating with multiple meanings, function by using collusion as their driving force. He employs objects, scale models, installations, sounds, and writing to classify the unclassifiable and mirror-in the work of art itself - the dialog that arises between the viewer and the artist. Eleven guitars mounted on tripods, controlled by a computer system that makes them play a riff based on the famous "money chords" that guarantee you a hit. In jazz, rock or easy-listening music and many other genres, these three-note chords, which feature at regular intervals in a given melody, have been part of music since the troubadours of the Middle Ages. The chords played by Saâdane Afif's guitars were composed using the colour codes of the famous sticks of André Cadere, an artist who acquired lasting fame for always walking around with stripy, painted multicoloured sticks of various sizes. Each stick was based on a logical mathematical sequence, to which Cadere added an error. 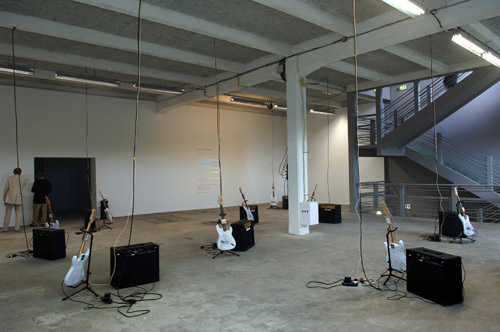 Consequently, when the guitars play a series of riffs based on stick's colours, one of them is always dissonant… The text printed on one of the walls, Pop (Power Chords), is actually song lyrics written by Mick Peter, and based on Afif's work.